Established in 2014, our system has been, successfully and quietly away, supporting major outdoor events accross the UK. A friendly and personal service, that understands the needs of the event organsier - and trader alike. Pop your festival, show, fair or other event details on our form. Allow us to create an account and an attractive event listings page for you. Individuals and teams can also manage their stallholder applications on one, easy to use system. 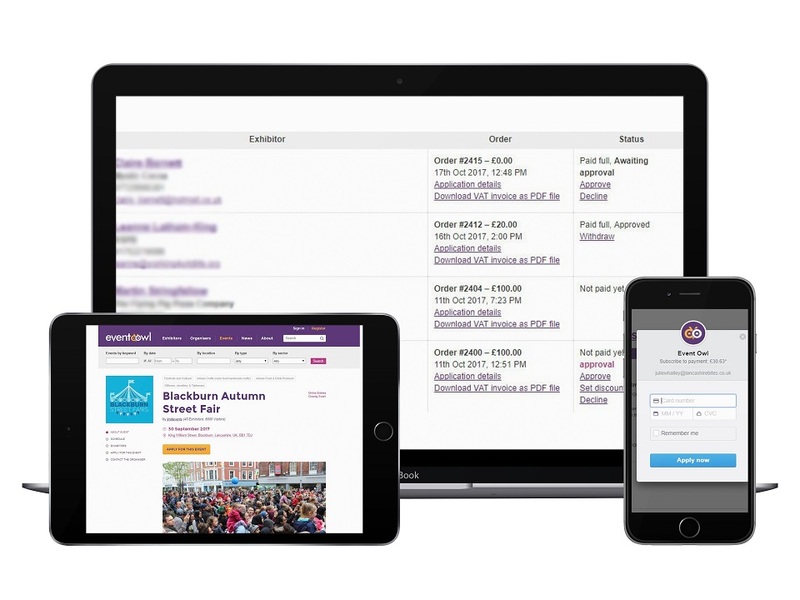 You can embed your tailored event stand booking/­application form, into your own website, with an option to list it and attract traders and visitors from ours. Event Owl works on any device, anywhere in the world, great for those who work on the hoof! Our friendly, experienced event team manage your account and work with you to attract traders and visitors. Event Owl allows people to think more, chase less, and have more time to spend enjoying our, once only, life. The human brain evolves around our finding ways to make life easier and more enjoyable, so we have more time to physically connect and enjoy the planet we live on. In the not too distant future, technology will have reached the point where humans will have more time to relax, think and enjoy experiences. The event industry is key to the enjoyment of life. It is where amazing experiences are provided and wonderful memories made.